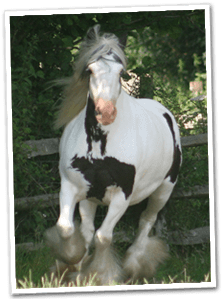 Please call us or contact us through the CONTACT US page if you're interested in any of the horses listed here. 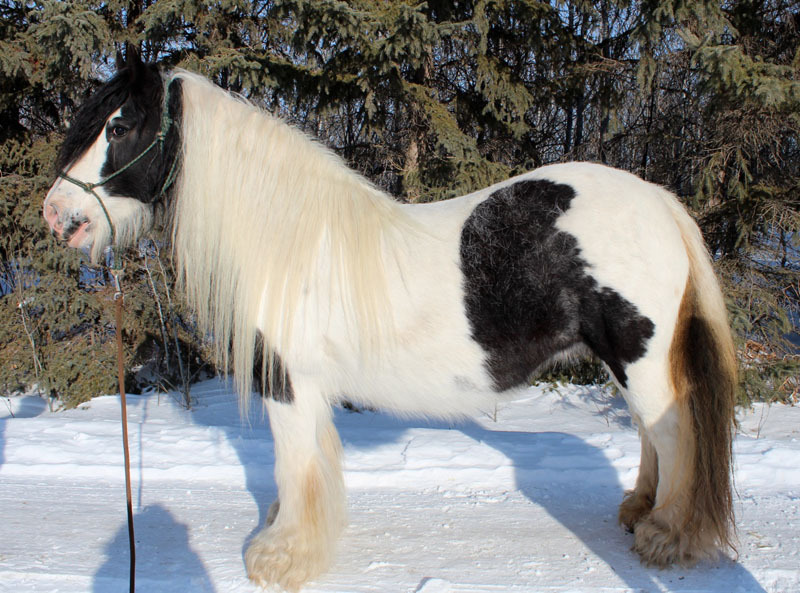 Description This mare is simply stunning. 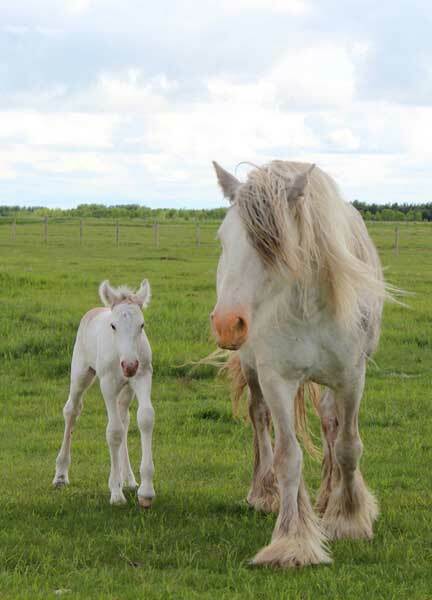 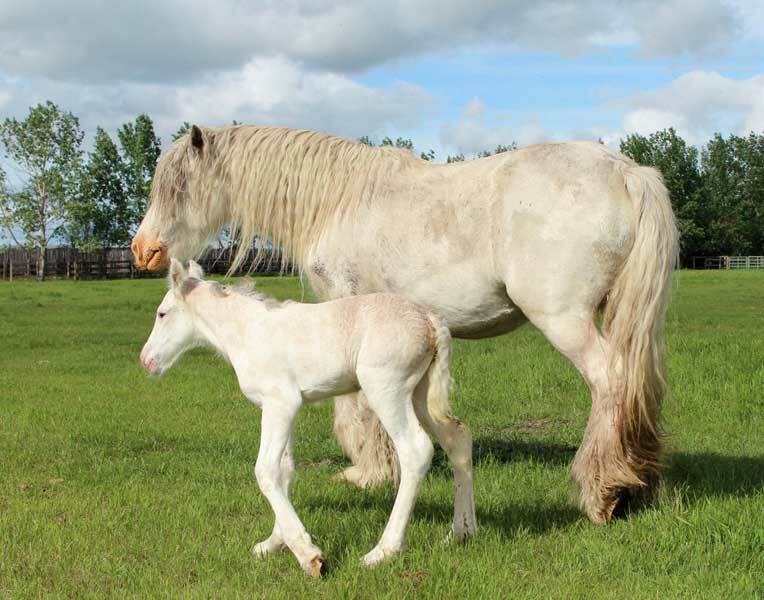 As Bailey’s second foal and Aslan’s very first daughter, this pairing has produced a very unique baby to say the least. 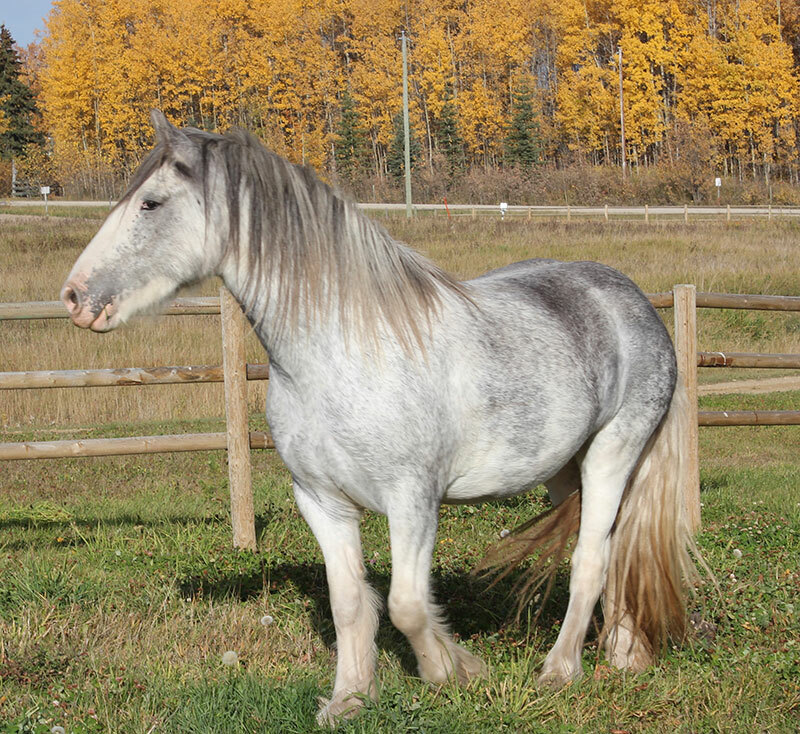 Delphina is a smokey buckskin Sabino with a silver mane and silver streak through her tail. 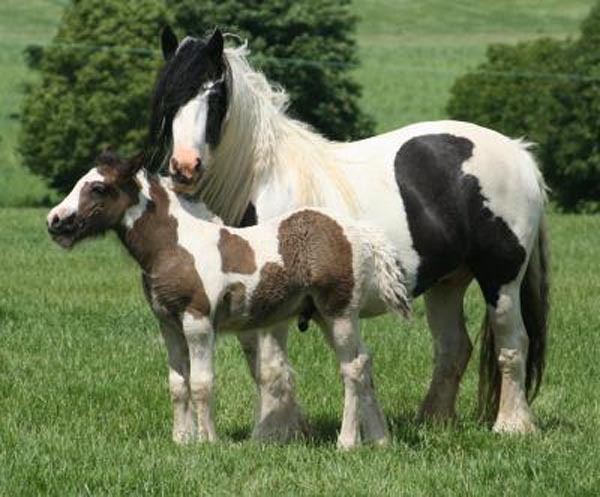 There is no doubt that Delphina will have her mother’s height passed on to her and a great body to go along with it. 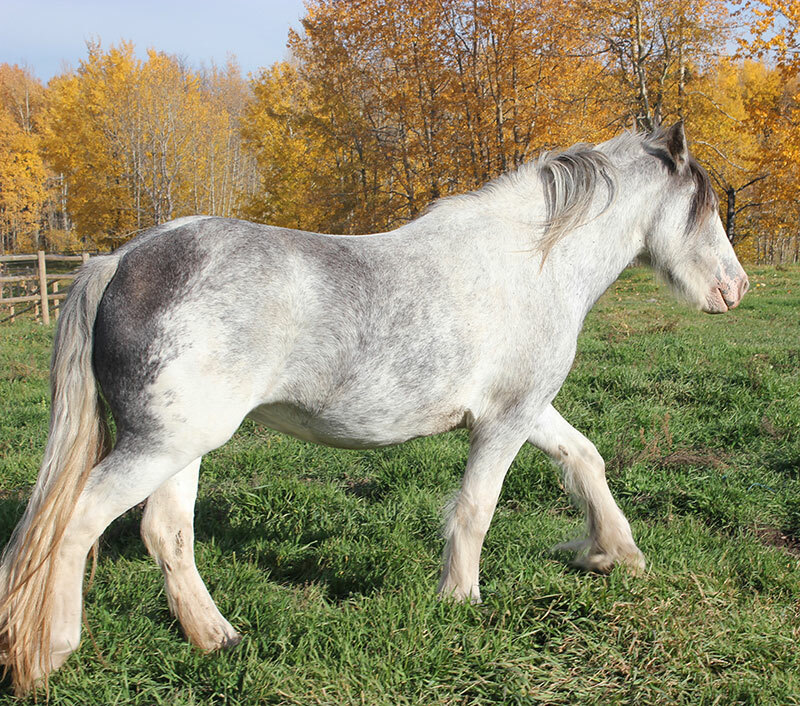 She is a supermodel in the making and will certainly be an exceptionally valuable future brood mare. 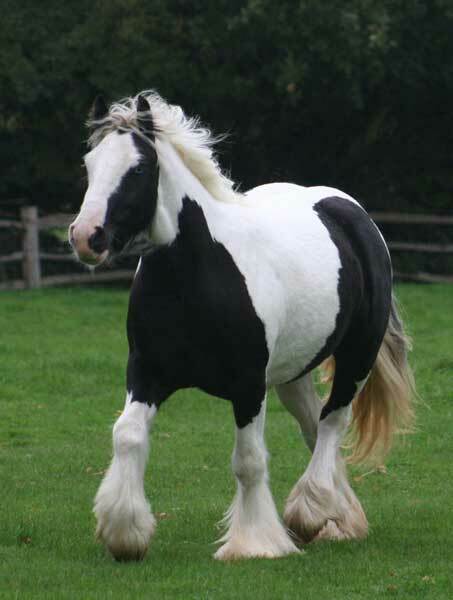 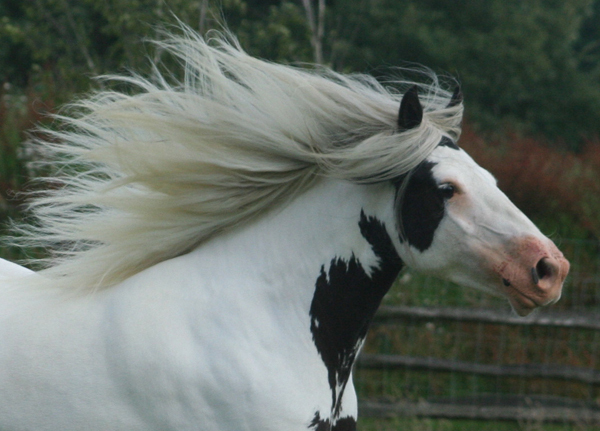 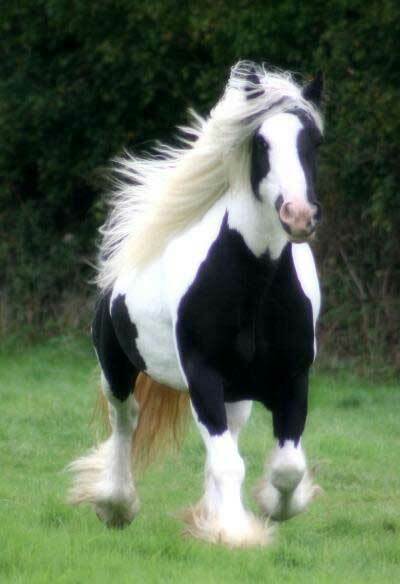 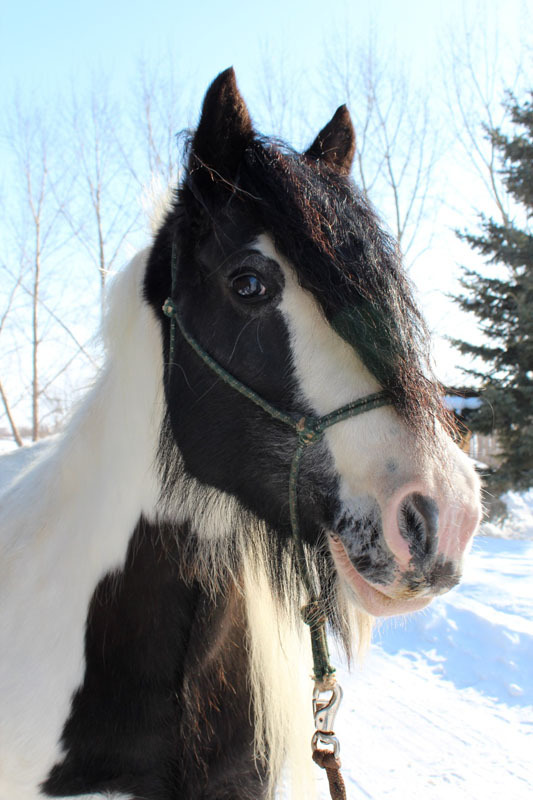 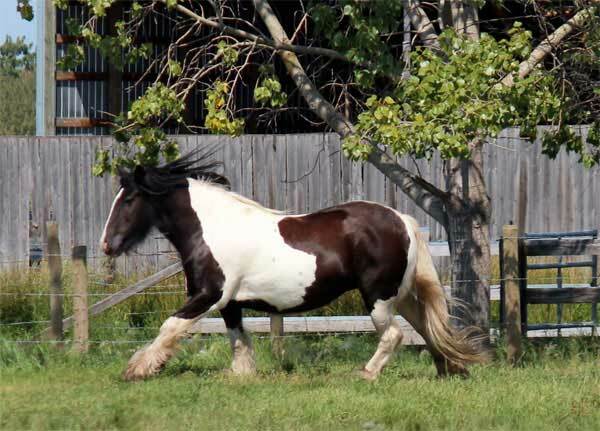 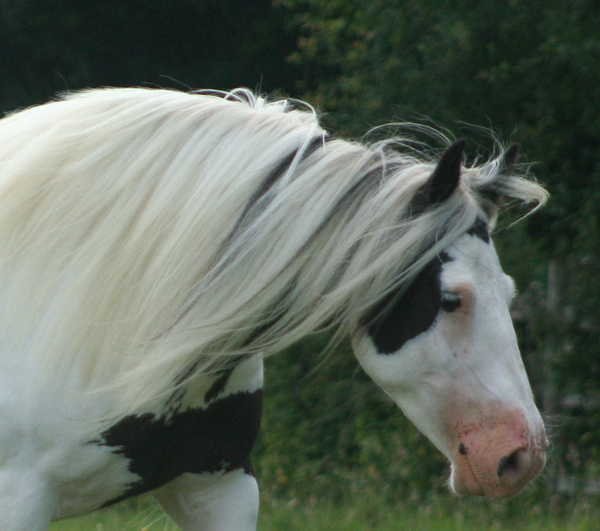 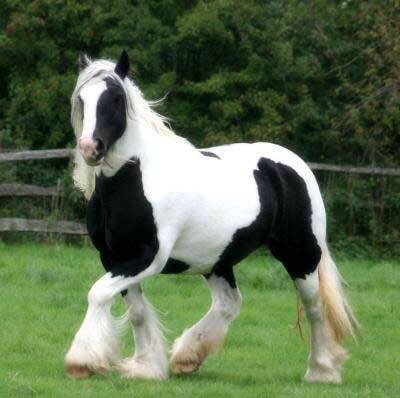 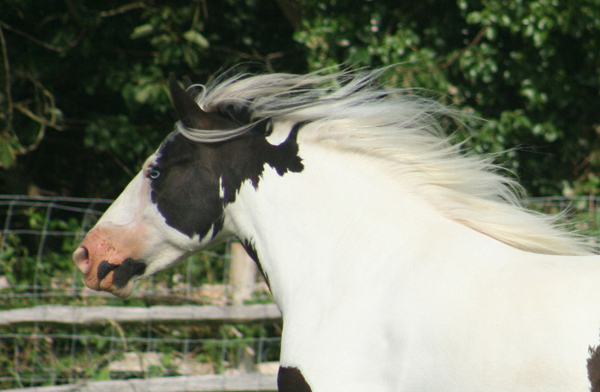 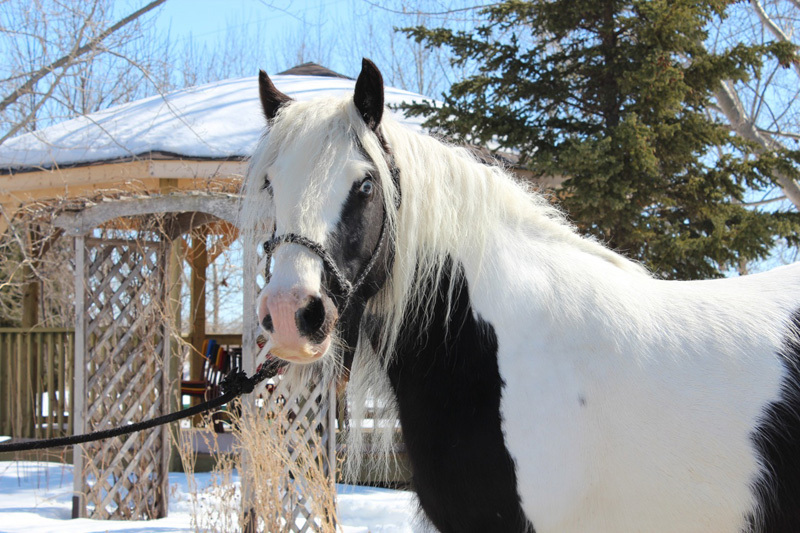 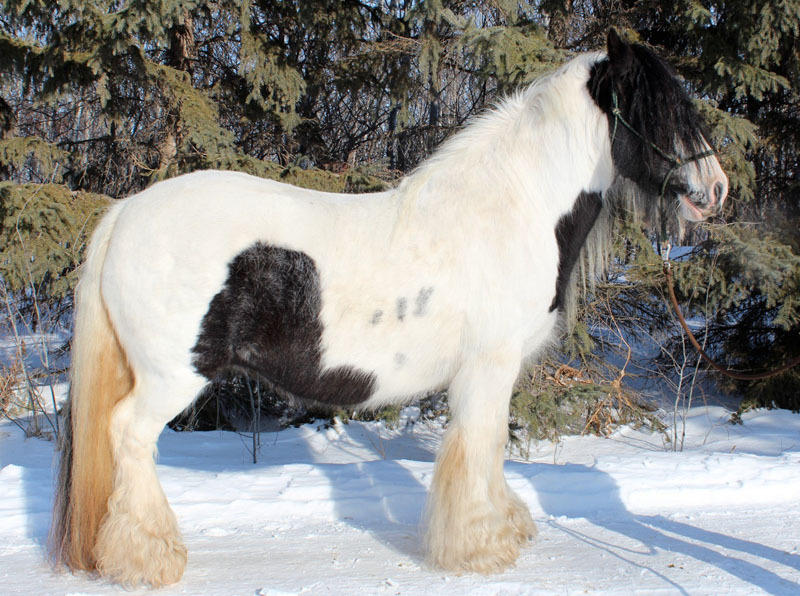 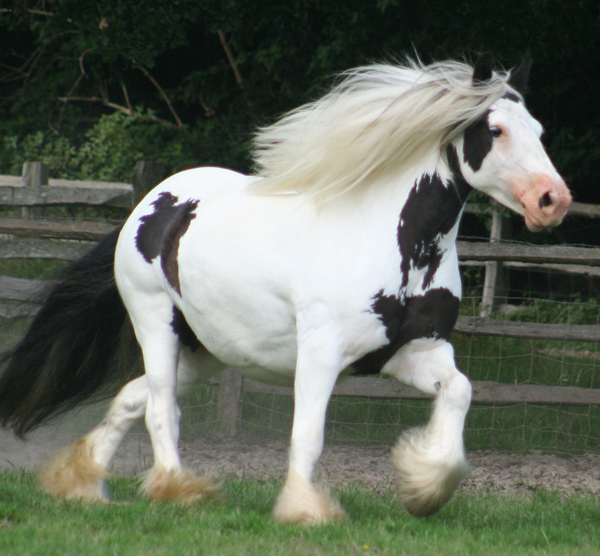 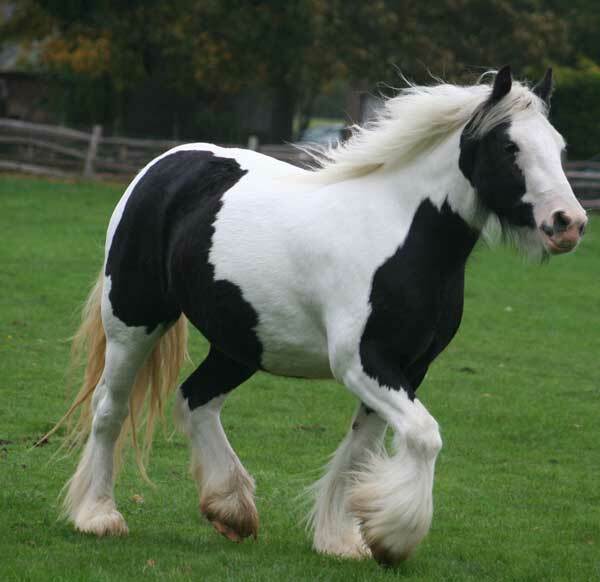 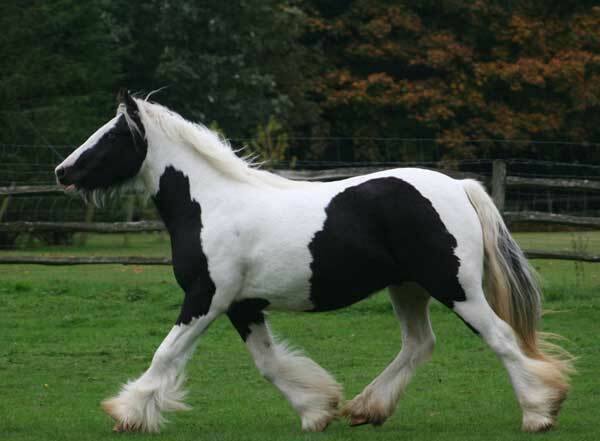 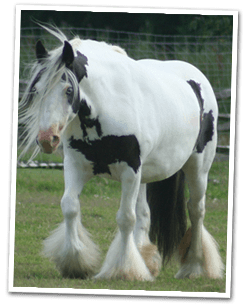 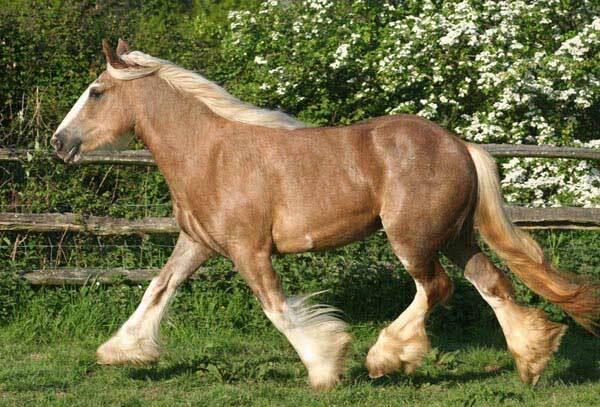 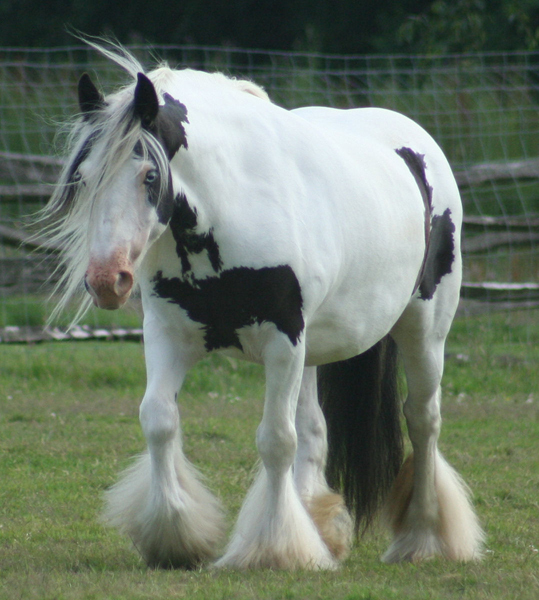 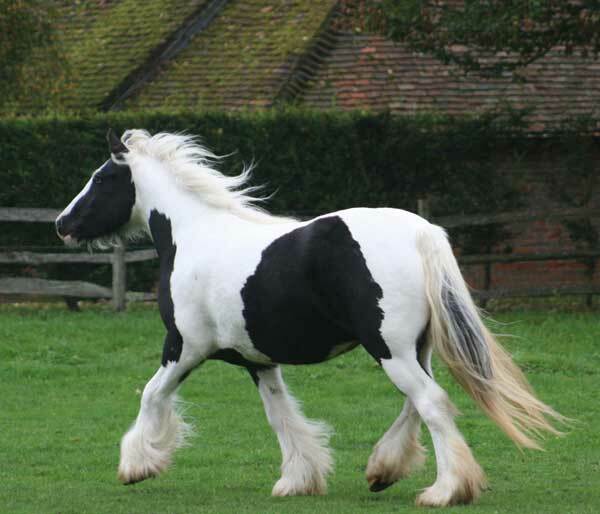 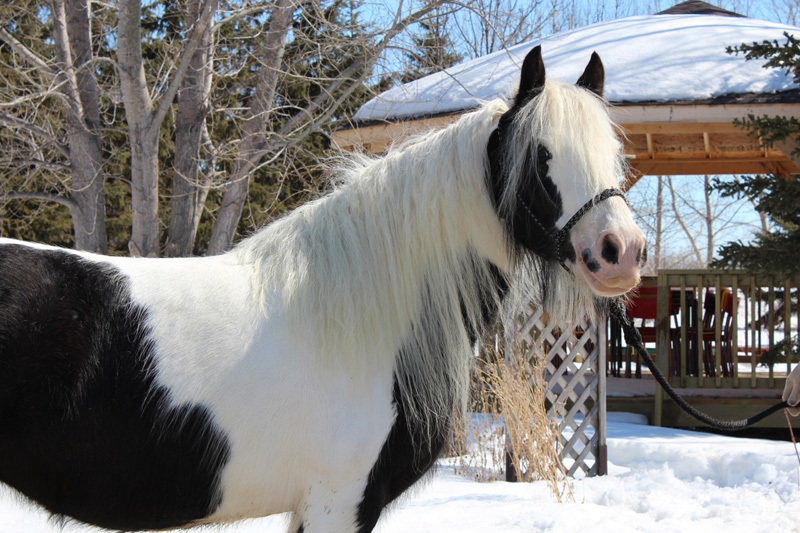 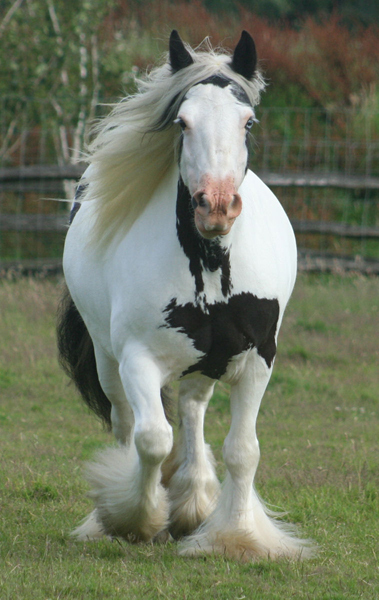 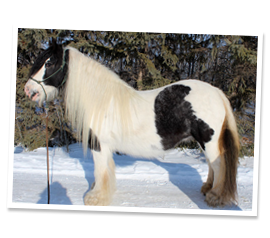 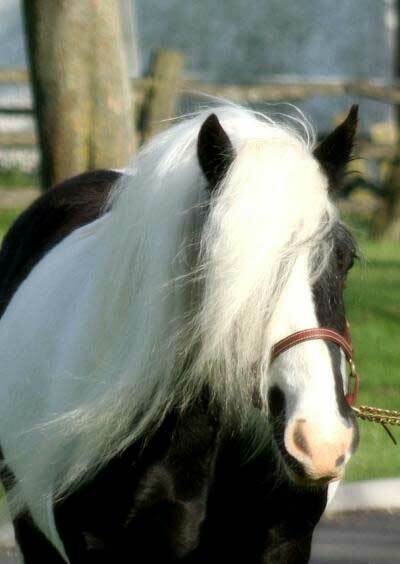 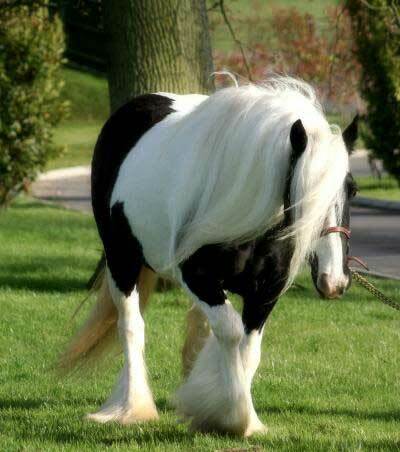 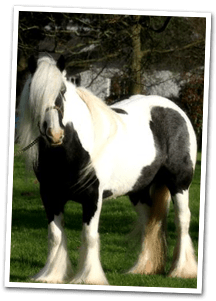 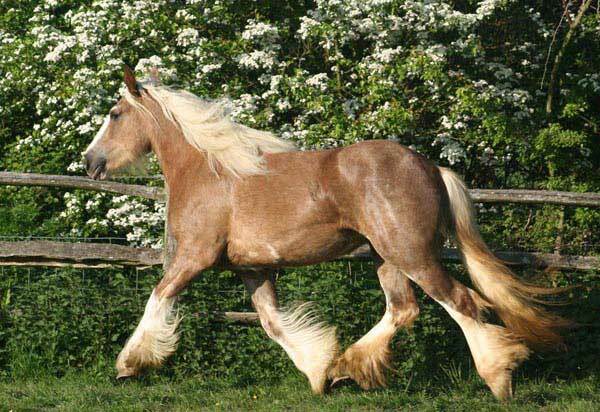 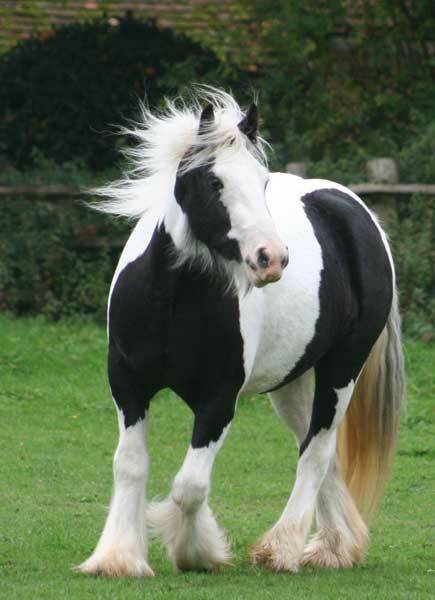 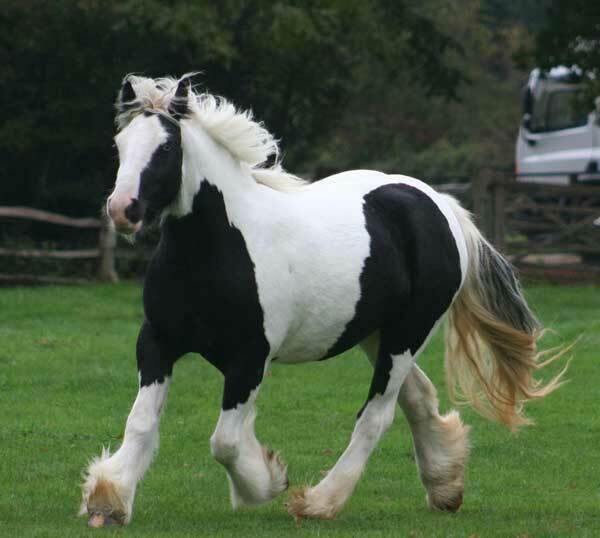 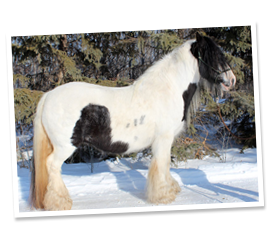 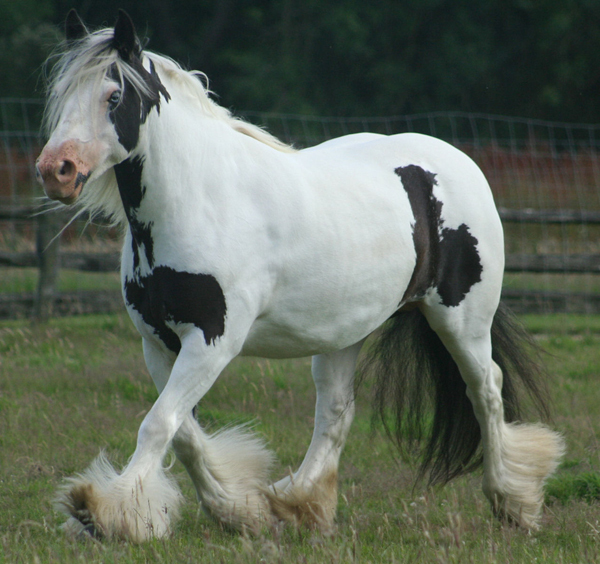 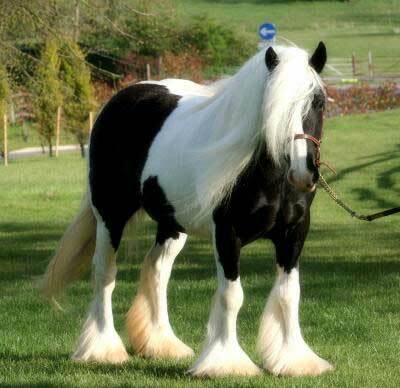 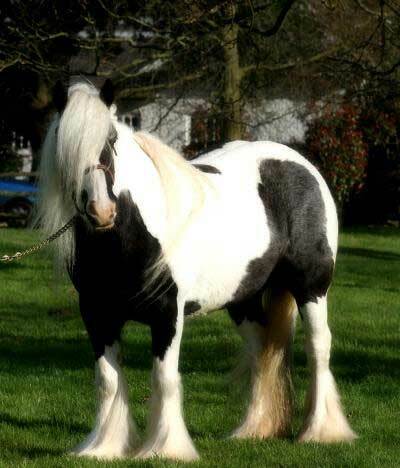 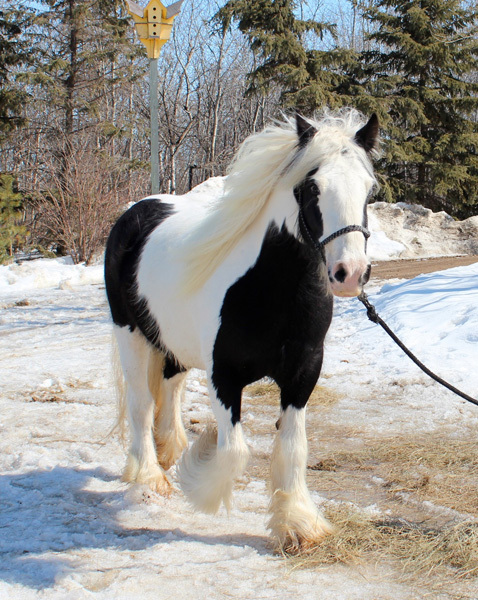 Description Approximately 14.2hh, Violet is a spectacular example of everything a Gypsy Cob should be. 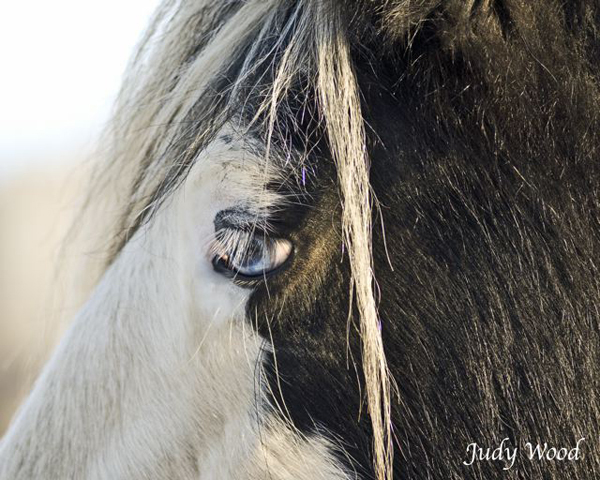 Her soft heart matches her romantic appearance produced by a long flowing mane and the striking combination of one blue eye and one brown. Beauty, born late in 2008, promises to carry on the tradition of her mother in looks and stature. 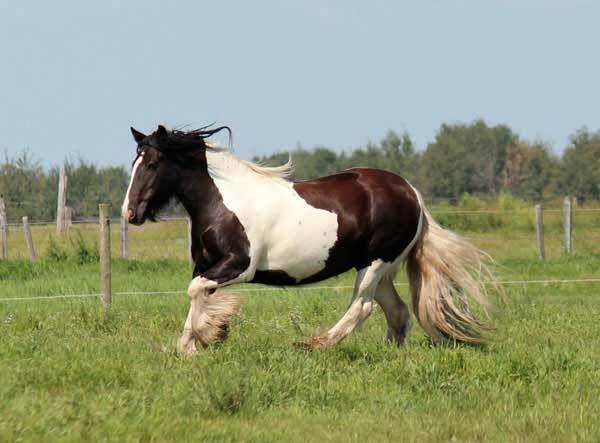 Since then, Sierra, Akasha, and Cayenne are all striking examples of her wonderful “jaggedy” patterns and lovely conformation. 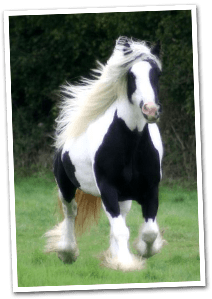 Description Celestial is possibly one of the best bred young mares from the UK and in North America at this time, and the most stunning mare we’ve seen yet. 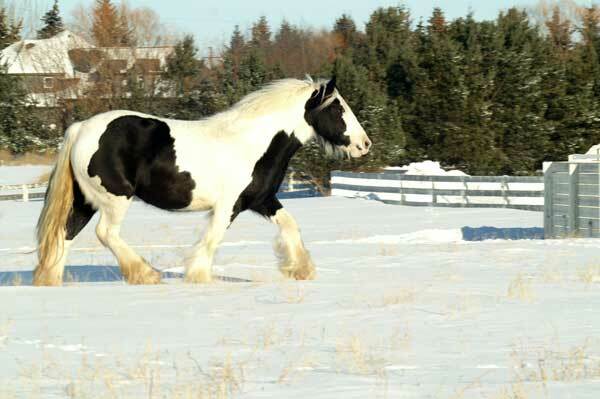 At approximately 14.1 hh, she comes from a line of phenomenal breeding. 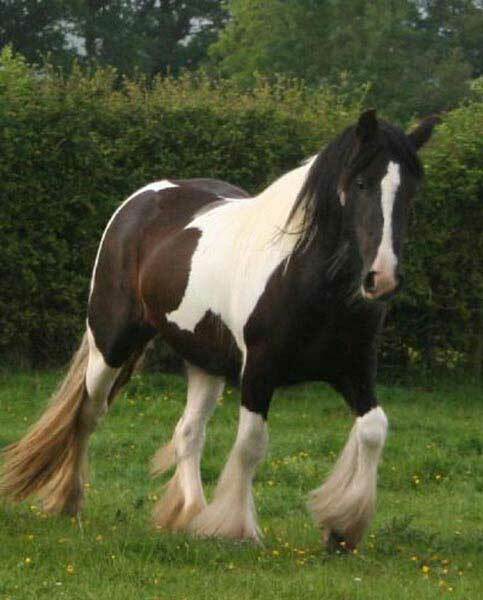 Her dam (“Billy Gaskin” Mare) is famous enough in her own right, as her sire was the Old Paddy Horse from Ireland. Celestial’s sire, Horseshoe Boy, was from the Original Horseshoe mare. 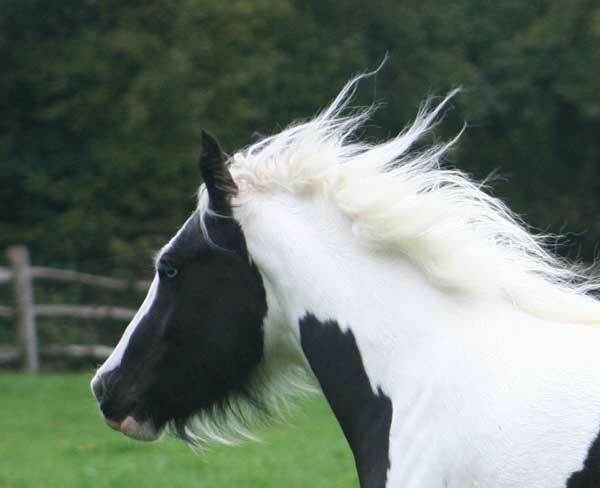 With a background like that it is no wonder that Celestial possesses all the wonderful characteristics the top Gypsy breeders are trying to achieve. 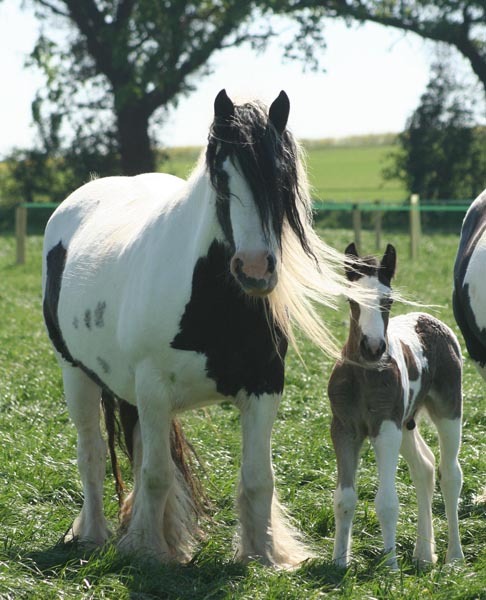 She is also heterozygous for the red factor (E/e) so has the ability to produce sorrel or chestnut offspring depending on the colour genes of her mate. 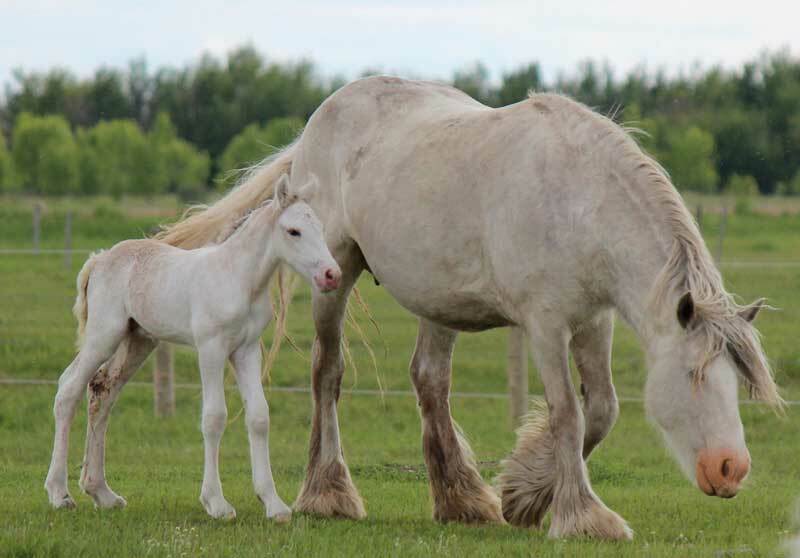 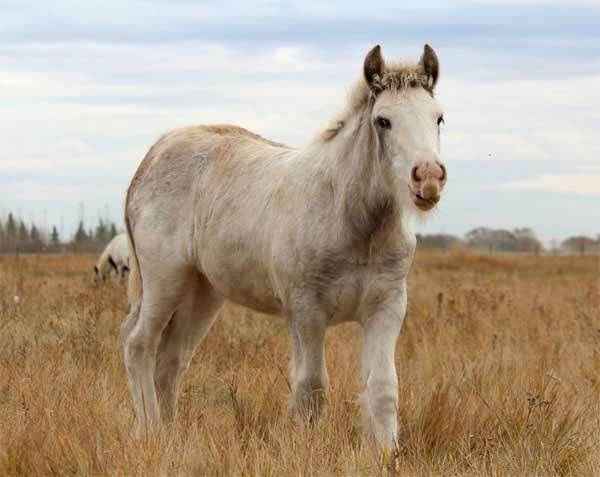 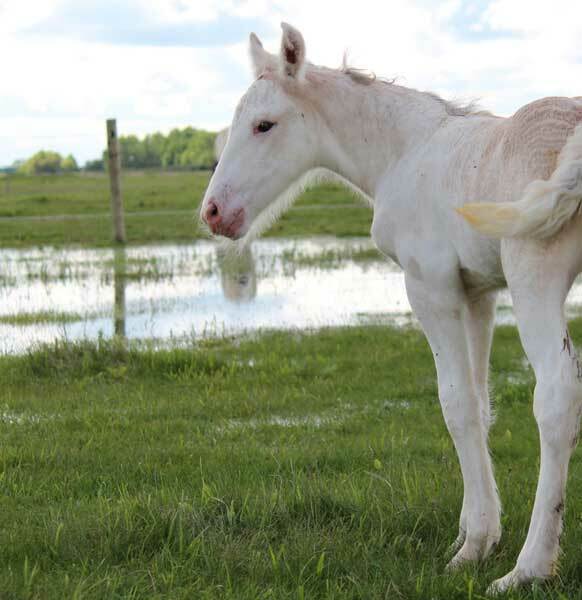 Her 2012 colt with Billy Boy is a keeper with his bay and white colouring and beautiful blue eye. 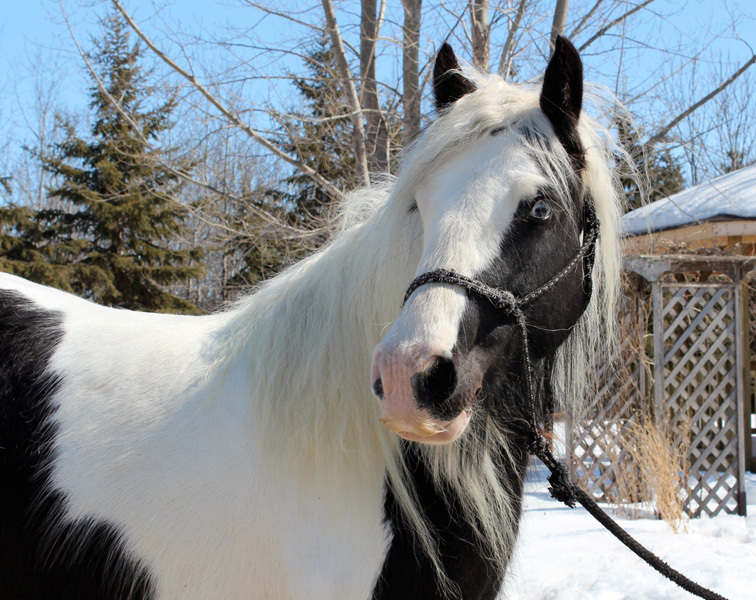 Description Isabel's unique colouring and lovely soft personality makes her a real prize! 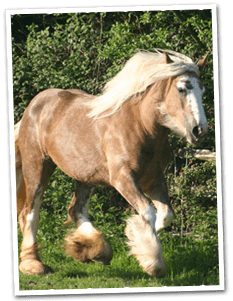 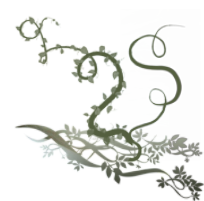 Her flowing mane and full feather ensure she's a pleasure to watch or work with and she loves the attention. 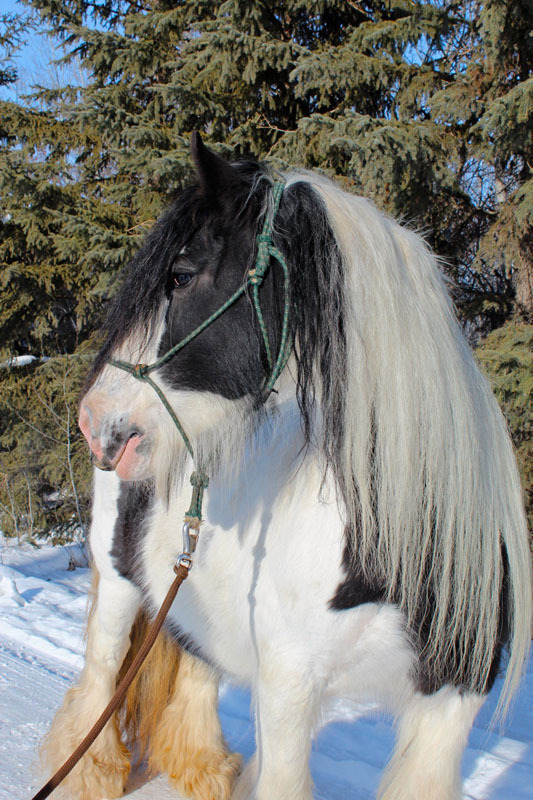 Lightly broke to ride, Isabel is 14.1hh. 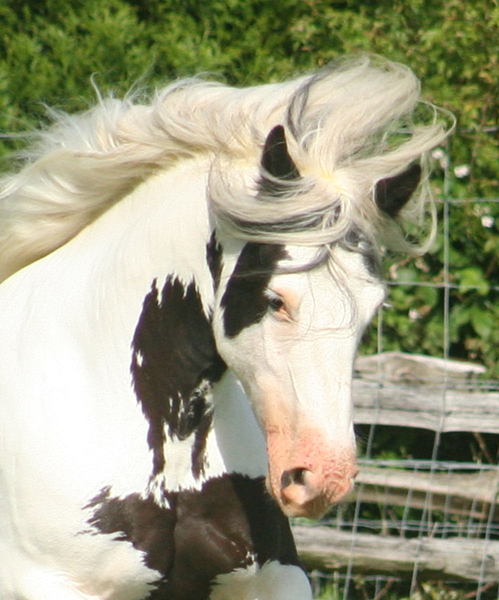 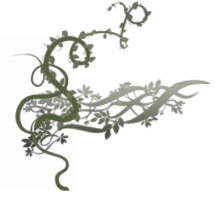 *This sale would be for a non-breeding contract only. 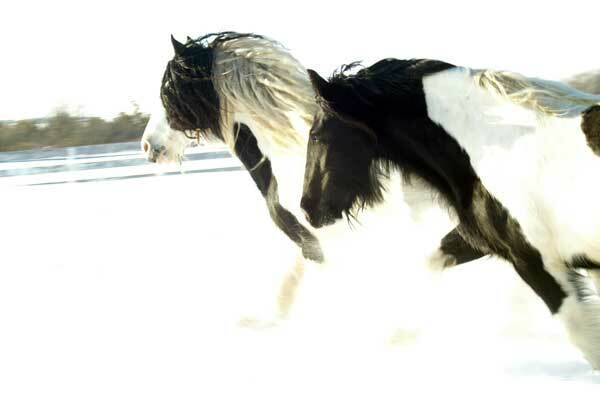 Description Miss Pio is an absolute supermodel! 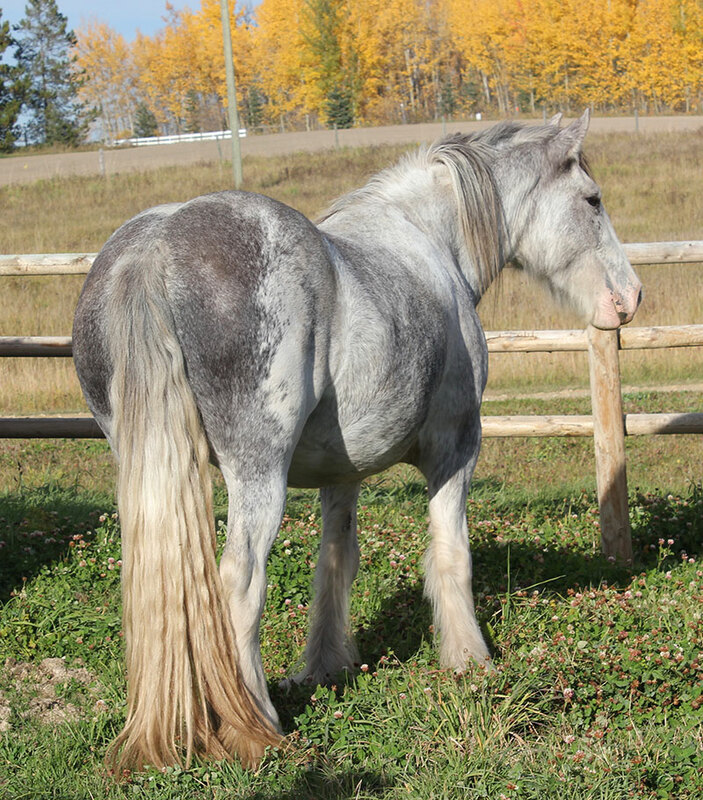 She is on the smaller side just shy of 14hh. 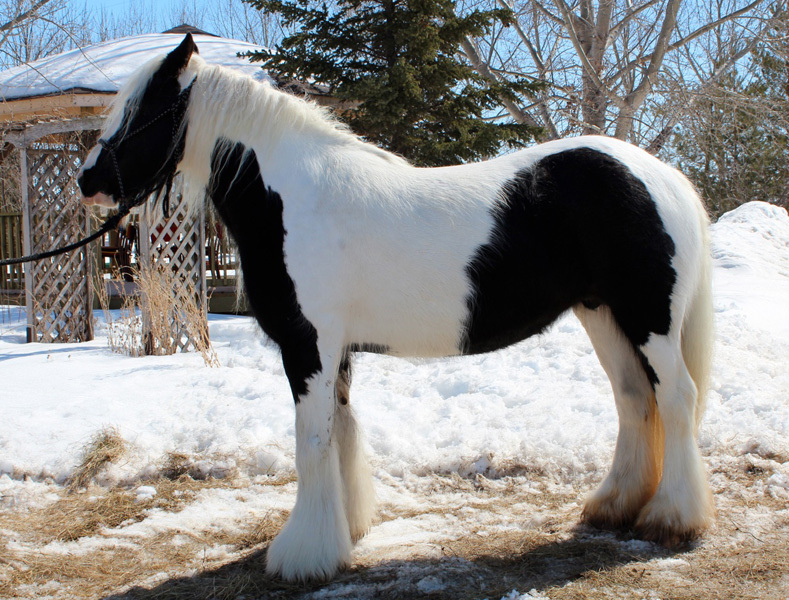 She is out of a Pio Daughter, and is by a Black Blagdon stallion who is by Henry Connor’s Blue Blagdon stallion. 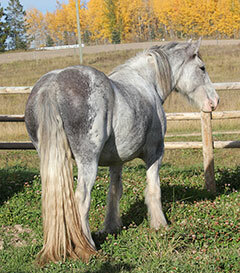 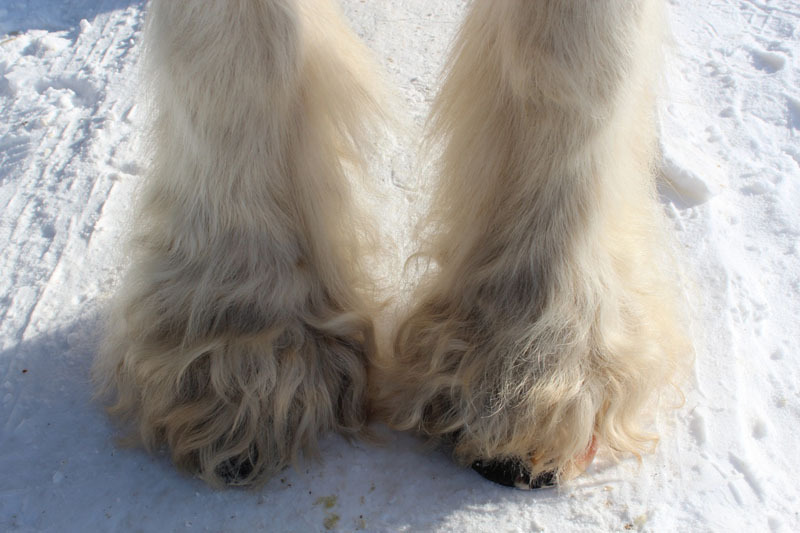 She is a charming mare who loves being groomed to look especially pretty. 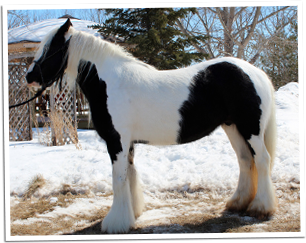 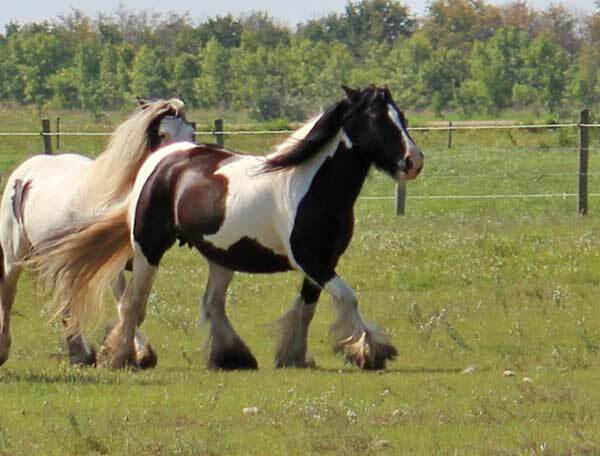 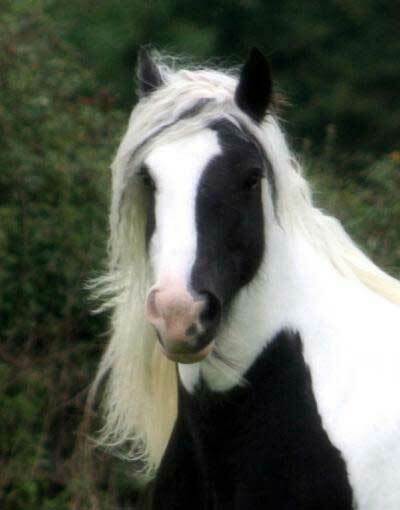 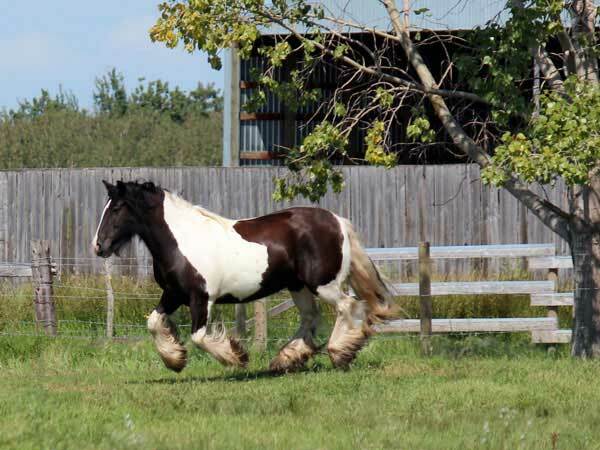 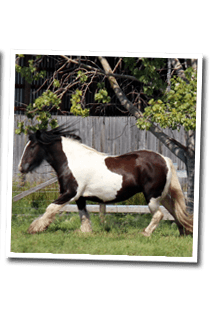 This mare has all the Gypsy Cob attributes, body type, bone, feather and the disposition to cap it all off. 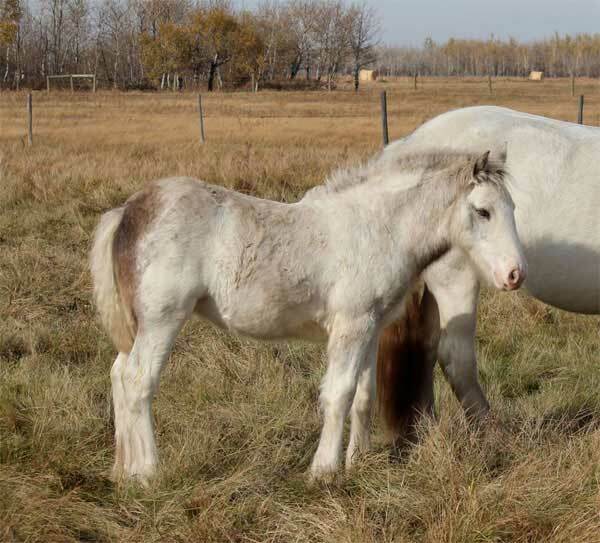 She has a tendency to produce solids, as evidence both by her 2008 colt Riot and now her 2011 filly Bella. 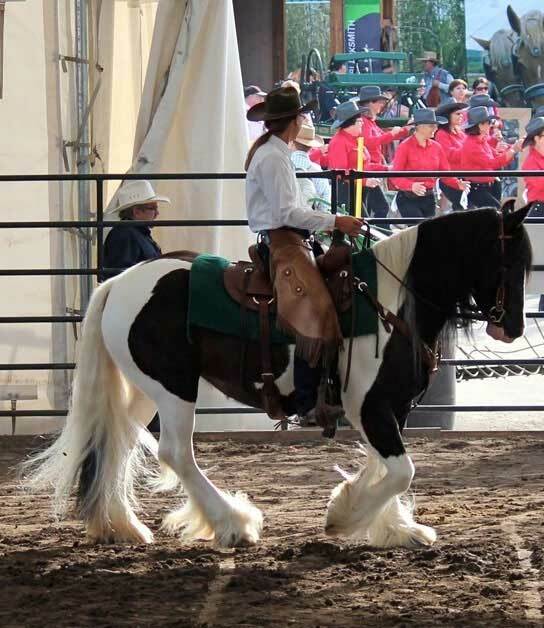 Traditional to the max, Miss Pio continues to impress each year. 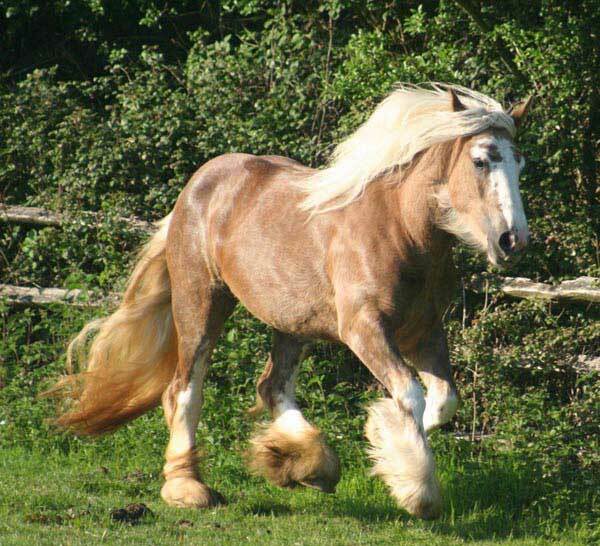 Description Lioness is said to be a full sister to the famous Lion King. 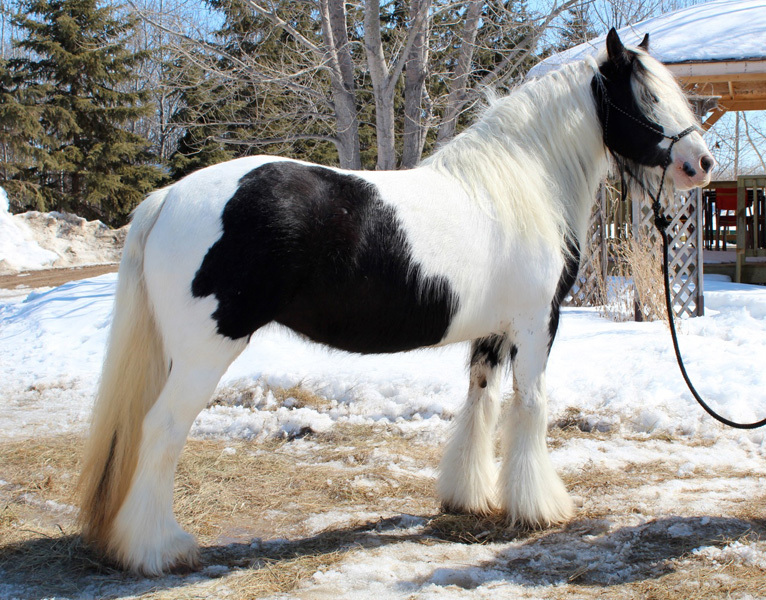 She lives up to all expectations of this line with her gentle disposition, black and while colouring, and the most mane, feather and tail we’ve seen on a mare in a long time. 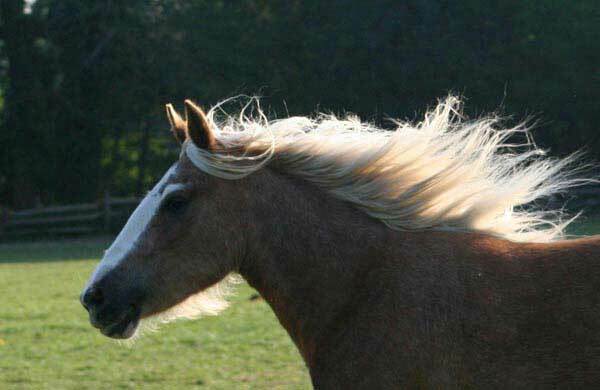 She passes her beautiful hair to all her foals and keeps on impressing us year after year. 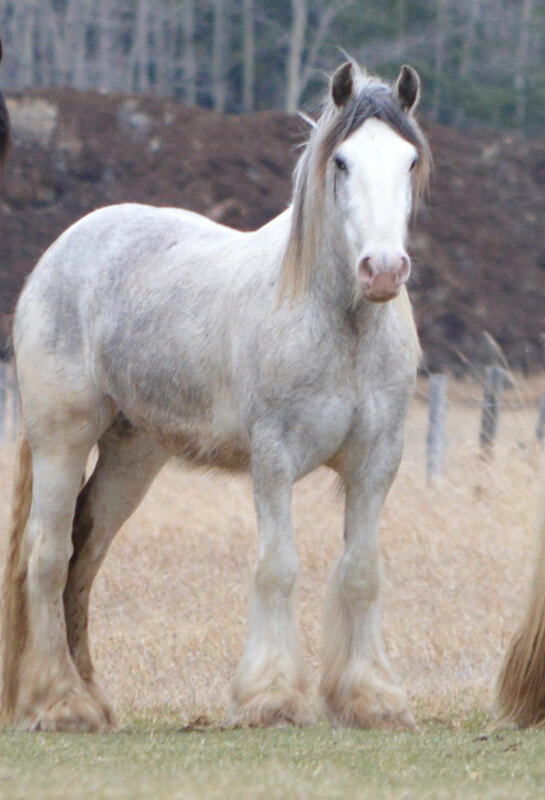 Mana, Tokeso, and Kaze are all amazing examples of her ability to pass on the family trait, in addition to stellar conformation and stunning beauty. Lioness is confirmed in foal to Tully for the 2013 breeding season. 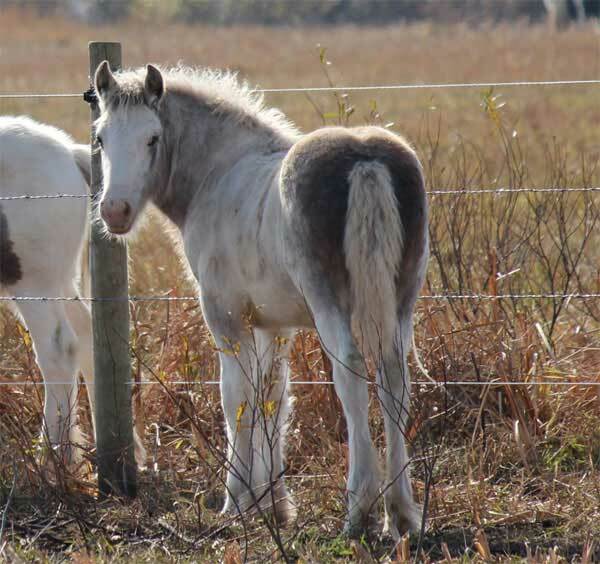 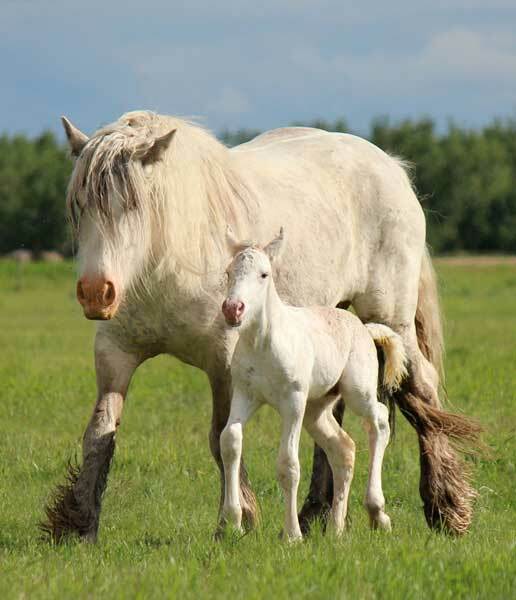 *Feb 2013 Shipment to new homes will now not be applicable until after 2013 foaling and foals have been weaned. 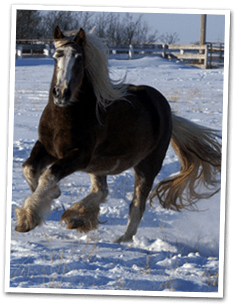 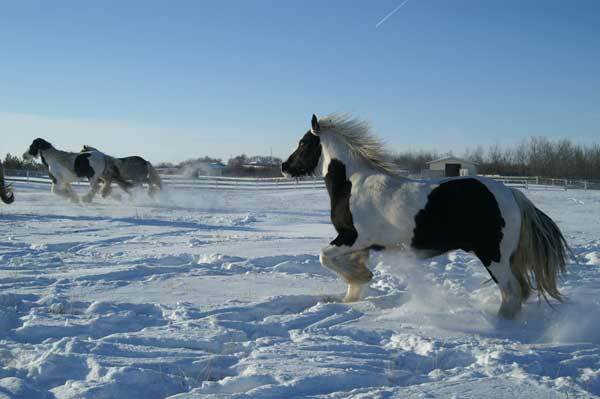 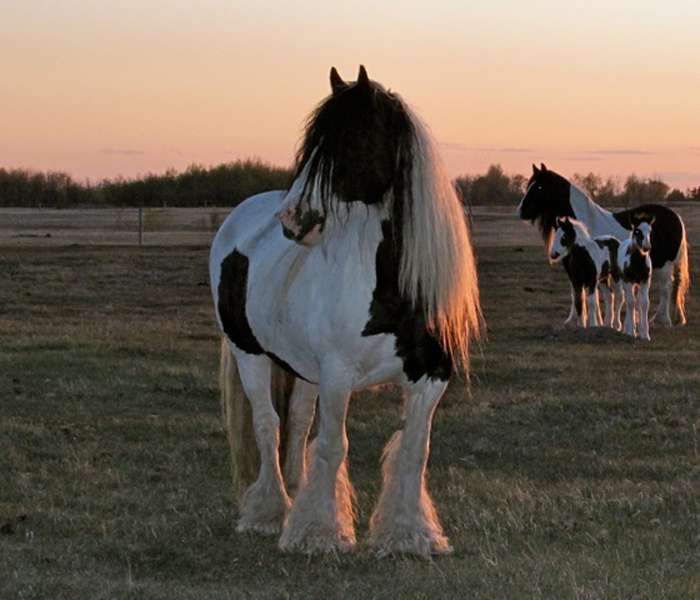 Mares would be re-bred to a North Fork Stallion of your choice before travelling to their new location. 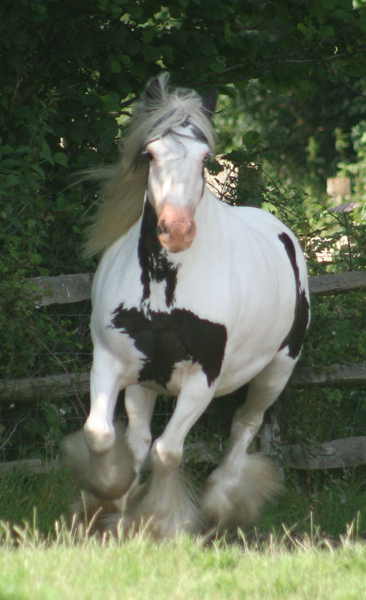 Description Bliss is about 15hh, a high quality young mare with fantastic movement and great length of stride. 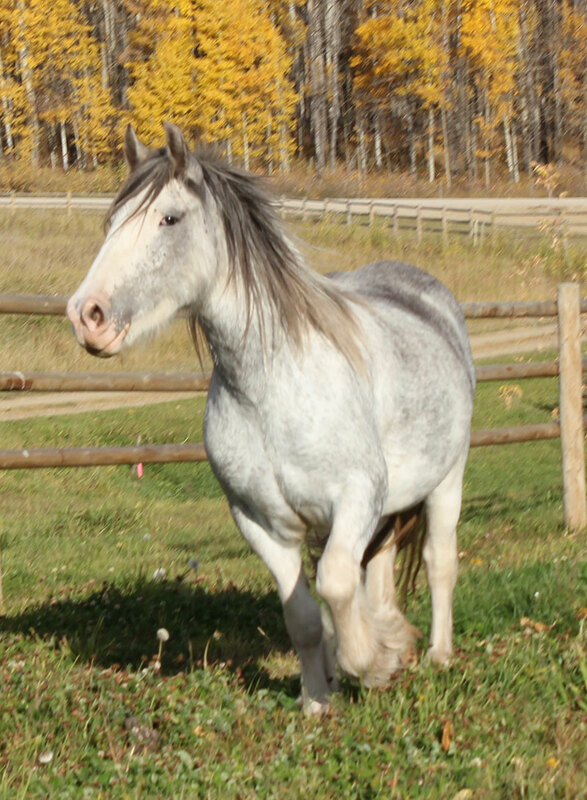 She is the lead mare of our herd, and well trained for handling as well as broke to ride. 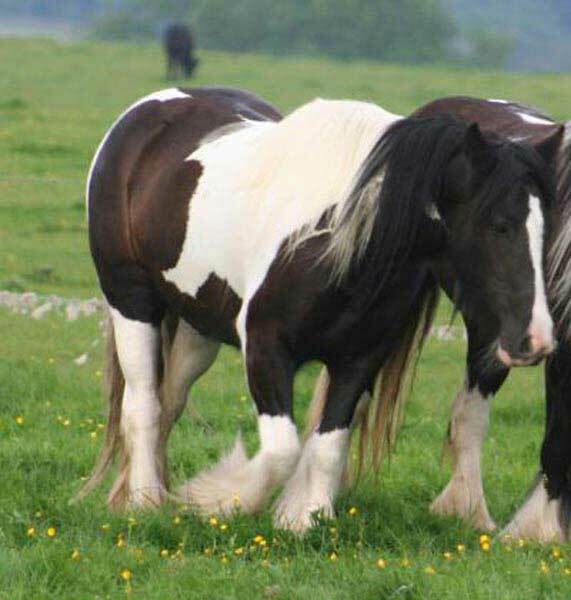 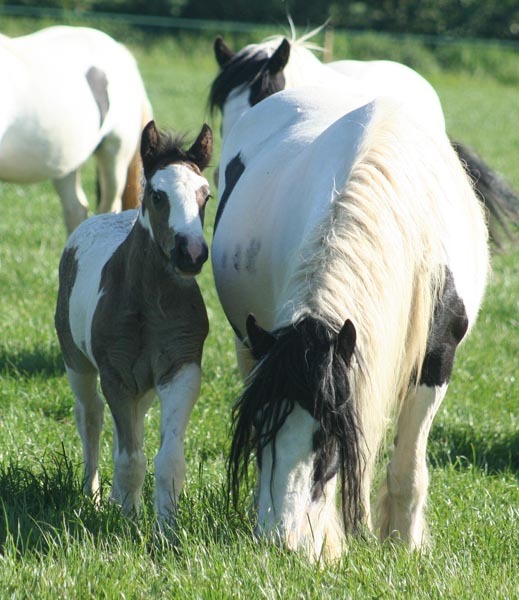 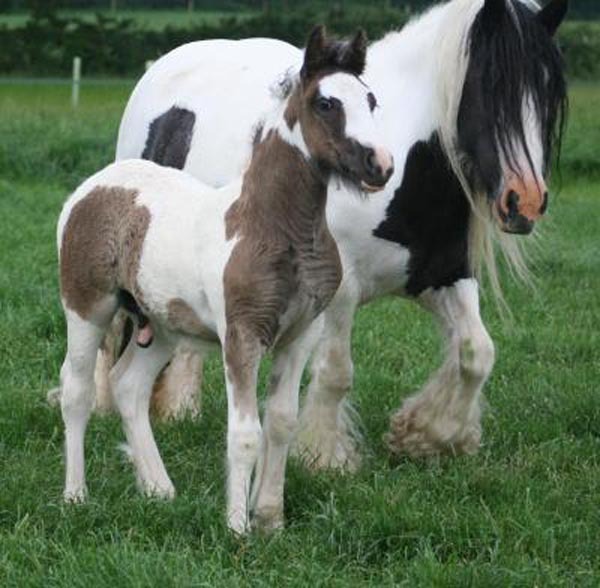 A crowd pleaser with her traditional Gypsy Cob black and white colouring, her 2008 colt Cash by Clononeen Tumbleweed is showing great promise to carry on the most desired characteristics of both parents. 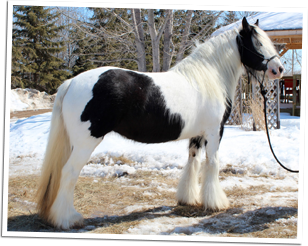 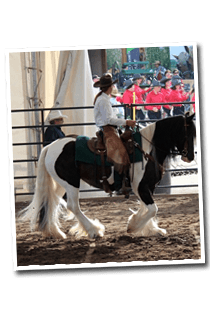 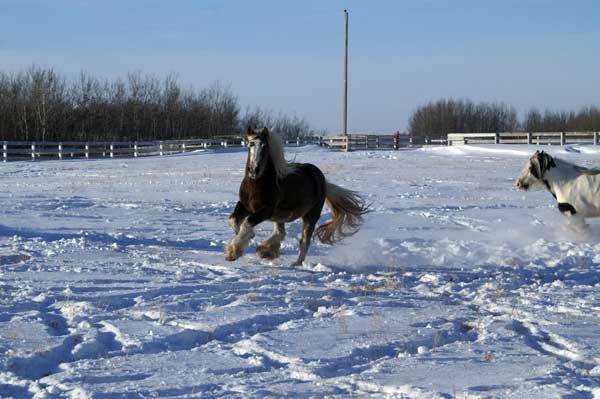 Bliss was one of our show horses at Mane Event and Calgary Stampede in 2010, and she did us proud!